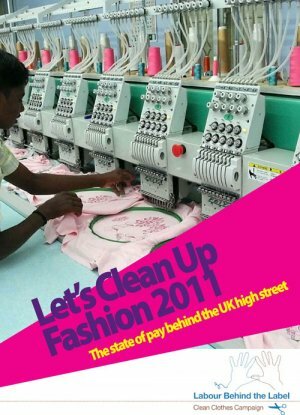 Labour Behind the Label has released a new report, Let’s Clean up Fashion 2011: The state of pay behind the UK high street (LCUF). With respect to a living wage on the high street, this is the 5th edition in a series of LCUF reports from LBL. The findings have ranked Levi Strauss and Gap Inc. with a score of 1 out of 5 (along side H&M, and others), while Zara, Monson and NEXT were found with the highest scores at 3.5 out of 5. LBL has created on online petition calling on Gap and H&M to do more. Click here to take action. Click here for company profiles and scores, and here for advice from LBL on where to shop. This entry was posted in Consumer Education, CSR, Cultural, Education, Environmental, Equal Rights, Fair Trade, fashion, Fast Fashion, HIDDEN NARRATIVES, Human Rights, Labour, Labour Behind the Label, Political, REPORTS, Responsibility, Social, Social Responsibility, Student Education, Supply Chain, Transparency, Tutor Education, Wages and Benefits on September 16, 2011 by Mary Hanlon. You’ve likely followed the mass faintings of garment workers that have taken place in Cambodia this year. While most reports have cited gruelling working conditions and worker exposure to toxic chemicals as likely causes, reasons for the faintings remain unclear. The report highlights an amendment to relax restrictions on fixed-duration contracts would compromise the rights of garment workers under both Cambodian and international law. As a result, the authors advise the government not to amend the current labour law. The study calls for the ILO-BFC program, along with other relevant parties, to work with stakeholders to support long-term contracts. In return, the program has stated it will investigate “how the general trend in using short term contracts can be converted in the industry wide understanding of the long term benefits of changing over to longer term employment relationships” (Media Update 17 August 2011, “Yale Law School releases a report on Fixed Duration Contracts”: ILO-BFC). 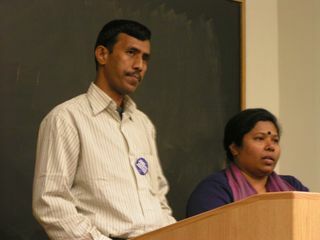 While we wait to learn how all of this will continue to play out, we thought we’d leave you on a positive note, and (re)draw your attention to an important health and safety education initiative we posted on our Facebook page a couple of weeks ago: The ILO-BFC’s Garment Workers Open University 2011. Check out the training resources available through the ILO-BFC, as well as their 2011 tentative training schedule. Click here for the list of active factories registered and monitored through the ILO-BFC. This entry was posted in A Closer Look, Cambodia, Consumer Education, CSR, Cultural, Education, Environment, Environmental, Equal Rights, Fashion Design, Fast Fashion, Freedom of Association, Health and Safety, HIDDEN NARRATIVES, Hours of Work, Human Rights, Labour, Overtime Compensation, Political, REPORTS, Responsibility, Social, Social, Social Alterations, Social Conditions, Social Responsibility, Student Education, Supply Chain, Transparency, Tutor Education, Wages and Benefits on August 30, 2011 by Mary Hanlon. Oxfam Australia has launched a new online campaign: Sneaky Business—a virtual march touring protesters across factories in Southeast Asia, China and Central America, all the way to the headquarters of leading shoe manufacturer, Nike. The march is a call for action for workers rights in the global footwear industry. As I write this post, there are 205 virtual protesters marching through Indonesia. When the march finishes up in the next few months, Oxfam will deliver the messages of each protester to the shoe manufacturers. Teachers, this sounds like a perfect project to get your class involved with come September. To join the march, simply choose your message and upload a picture of your sneakers! Bloggers, be sure to check out the Sneaky Business Toolkit. This entry was posted in Consumer Education, CSR, Education, Equal Rights, Fair Trade, fashion, Fashion Design, Fast Fashion, Freedom of Association, Health and Safety, HIDDEN NARRATIVES, Hours of Work, Labour, Overtime Compensation, Oxfam, Political, REPORTS, Shoes, Social, Social, Social Conditions, Social Responsibility, Socially Responsible Design, Student Education, Supply Chain, Transparency, Tutor Education, Wages and Benefits on August 9, 2011 by Mary Hanlon. 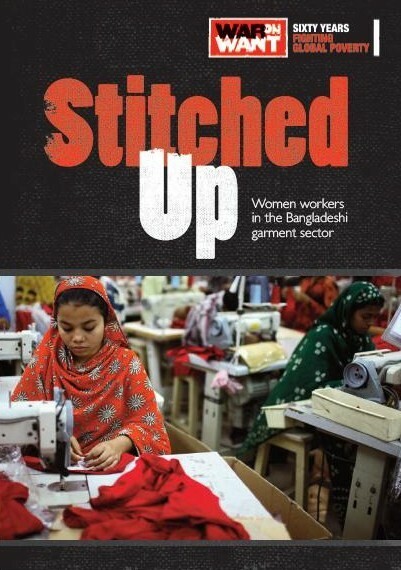 War on Want has published a new report outlining current conditions for garment workers in Bangladesh—Stitched Up: Women workers in the Bangladeshi garment sector. Of the many issues addressed in this report, the research outlines the true impact of short lead times, explaining how wages earned can depend on whether or not a worker meets production deadlines. It also showcases certain worker rights that have been denied as a result of an absent rule of law. 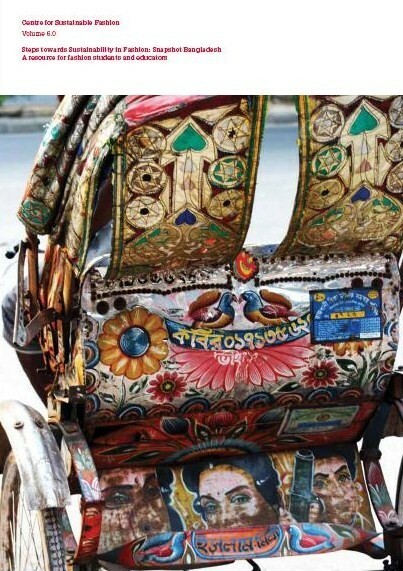 The report investigated 41 garment factories (there are an estimated 4,825 garment factories in Bangladesh) and interviewed nearly 1000 workers (there are an estimated 3 million garment workers in Bangladesh) (Stitched Up: pg 2). 86% of the mostly women interviewed (988/1000) were between the ages of 18-31 (Stitched Up: pg 2). Head on over to War on Want to read the report and to learn more. This entry was posted in CSR, DESIGN, Education, fashion, Fashion Design, Fast Fashion, Forced Labour, Freedom of Association, Harassment or Abuse, Health and Safety, HIDDEN NARRATIVES, Hours of Work, Human Rights, Labour, Overtime Compensation, Political, REPORTS, Responsibility, Social, Social Conditions, Student Education, Supply Chain, Transparency, Tutor Education, Wages and Benefits, War on Want and tagged Bangladesh, garment workers, lead times, maternity leave, Rule of Law, Stitched Up, War on Want on August 3, 2011 by Mary Hanlon. 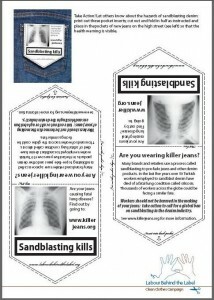 Labour Behind the Label (LBL) has launched a week of action today (May 30th – June 6th) to raise awareness on the dangers of sandblasting, a deadly hidden narrative of denim production. 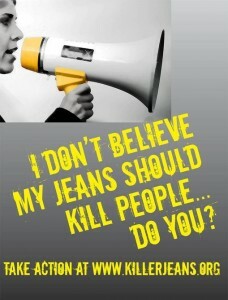 Visit www.KillerJeans.org to take action, hear company responses (communication and implementation) and learn what you can do to help ban sandblasting in denim production internationally. Click here to view an Animoto by Anna McMullen at LBL on how to take action. This entry was posted in Labour Behind the Label, REPORTS, Responsibility on May 30, 2011 by Mary Hanlon.